Tendon contracture refers to a condition where the tendon of a leg joint of a newborn is too short, preventing the joint from moving properly. The legs appear twisted or deformed. 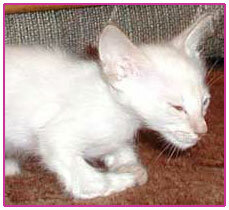 It is more common in kittens than most breeders realize. The condition may be on one side (unilateral) or both sides (bilateral). If bilateral, the condition may be mild on one side and more severe on the other. It can happen in any breed. It does not appear to be genetic, and just because it happens to the kittens of a queen once, that makes it no more likely to happen again in a future litter than with any other queen. 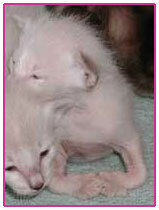 While the actual cause is not known, it is most likely that the "twisting" is simply a result of the way the kitten was laying and growing within the birth sac. If the kitten is crowded or the legs happen to be placed awkwardly as they grow, they become twisted, with some contracting of tendons and ligaments. There is some anecdotal evidence that there may be a genetic component but no scientific proof has been established. 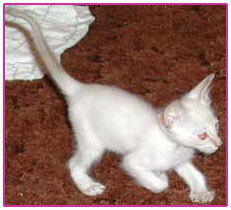 While hind leg contractures are by far the most common form of contracted tendons in cats, occasionally a kitten is born with twisted front legs. Hind legs correct themselves with little intervention. 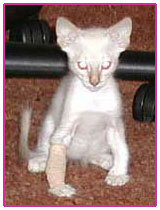 To see examples of kittens with hind leg tendon contractures read our article tiled Born With A Twisted Leg. 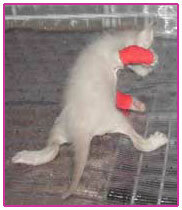 Front legs however require dedicated splinting and therapy to develop normally. 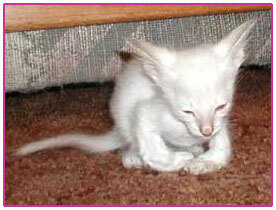 In 2001, Beth Garner of Haya-Ji Orientals had a white kitten born in a litter of five. 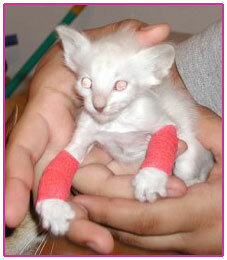 The baby boy had severely contracted tendons of both front legs and one hind leg. Beth was determined to help this special needs kitten grow up perfect and strong... and so this kitten and his breeder began a journey together down a road of experimentation and perseverance. It was obvious at birth that one of the kittens in the litter had problems. 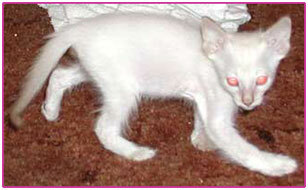 His right hind leg twisted inwards and both front legs appeared very "deformed". The arrow shows how the front "wrist" joint didn't straighten normally but is bent at a 90 degree angle. I decided this baby would be named Twister. I began researching about twisted legs on the internet and discovered than my kitten had contracted tendons in the affected legs. I learned that hind leg problems would correct themselves but that the front legs would need to be splinted as the kitten grew. By 2 weeks, Twister's rear leg had already corrected itself completely. I have been applying warm compresses to his front legs and then massaging and stretching them... or perhaps more correctly encouraging the too-short tendons to grow correctly. The body reacts to the stretching of the tendon as is does to bone growth and increases the size of the tendon. The reason that the rear contractures self correct is because the kittens are able to get their toes under them and stretch on their own. The front ones however are much tougher to walk on. As he started to walk he supported himself primarily on his wrists although he could get his paws under himself at times. The front feet were more flexible, but still did not extend fully. 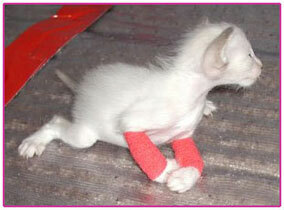 Here is Twister at three weeks with his first set of splints. They are made of a 1"x1/3" piece of tongue depressor covered in gauze and held in place with stretchy vet wrap. But I had trouble finding (making) the right splint for Twister. When I add a stiff brace (plastic, wood or cardboard), his paws would swell after having the braces on for a half hour or so. If I left out the "brace" material and do a "soft" wrap with just the elastic bandage, the whole affair would slip up above or down below the bend in his leg. It would be totally ineffective. By this point Twister had become accustomed to walking on his wrists, so despite the splints help in straightening his legs, he is still struggling to walk in them. The splints are encouraging him to put his paws underneath him, but he gets very tired and rests a lot. Because of this, I am only leaving the splints on for an hour, and no more than twice a day for now. I also left his front claws unclipped to give him as much traction as possible. He learned to walk on his wrists and the inward bend in his right wrist became quite pronounced because of this. These pictures are at 7 weeks and he is recovered completely from the URI, this is right before I started splinting him again. The wrists are bent inwards in addition to not fully extending. He did not walk on his paw pads at all. Because of this he could not really run but would "hop" instead. He couldn't climb or catch a toy with his paws. I felt so discouraged. I finally found the right splint that worked for Twister! It doesn't slip off! His paws don't swell! And it is light enough that it doesn't hinder his walking! This meant I could finally leave them on for more than a few hours. Of course, Twister sulked and refused to walk for the first night, but I resisted the cute kitten face and left them on anyway. In the morning he as walking like a champ, up on his paw pads for the first time! He figured out that it was much easier and quicker, since his feet didn't get caught underneath him. I let the kittens out to play in the living room, and I saw Twister run for the first time ever. He looked so happy, I nearly cried. Even after just one night, the flexibility in his wrists improved a great deal. He started to play like a normal kitten, it was wonderful to see. Johnson & Johnson Hurt-Free Tape, 2" inch - stiff padded gauze wrap that sticks to itself but not skin (or fur). Small 1/75" cardboard piece, rounded on edges. Cut from center of vet wrap, has a slight curve to mold to the leg. Nexcare Self-Adherent Wrap, basically vet wrap. 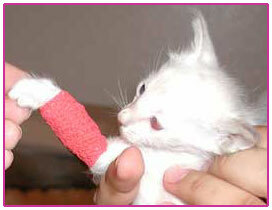 For each paw: cut one length of the gauze wrap long enough to wrap around twice, from top of toes to elbow. Wrap firmly but not tightly, only a slight stretching of the material is needed. The 2" size is ideal, no cutting required. Place the cardboard in the best position to brace the contracture, and hold in place with a piece of medical tape on the top and bottom. It is not necessary to go all the way around the limb, but if you do make sure it is not tight. Cover with a layer of vet wrap, just enough to cover and protect the gauze. Again, be careful not to wrap it tightly. This adds support, but should not add too much weight. Here's Twister on a break from his splints showing off how he can walk on his paws now! He runs around and chases his sisters, and loves to attack the little fuzzy ball toys. The left ankle can almost extend fully, the right is showing a lot of improvement. Now that Twister has learned how to walk correctly he is building the correct muscles and stretching those tendons on his own. At this point the braces are on at least half of the day with several long breaks. I continue to stretch those tendons but still force Twister to build the muscles and use the joints. They splints seemed to make his legs itchy, so he really enjoyed the massage I would give him they come off. :) The physical therapy of course is still very important. Twister had joint laxity in his front right paw. Because he had walked on the side of his paw so much, the joint "collapsed" outward. The contracture had straightened by 10 weeks and he did place his paw down correctly, but his right ankle would buckle when he placed weight on it. So he still had to wear a brace on his right leg. It was only a soft wrap of vet-wrap, like an ace bandage. Both legs could be flexed into a near normal position, but only the right collapses. He could sit with it fairly straight, but as soon as weight was applied the joint could not hold. I started wrapping his right leg only for 12 hours at a time in hopes that it will help him build muscles to hold it correctly. The wrapping of his right leg worked very well and within two days his leg was able to withstand weight with only a little collapsing. Over the next week or so it continued to bear more and more weight without collapsing. Twister was visually 98% normal at this point. I could still feel a little stiffness when manipulating his joints. They did not flex quite as flat as they should, but I was confident that they would continue to improve. Twister walked, ran, jumped, and played normally. By 4 months Twister was completely normal. He has no stiffness in any of his joints. His right wrist couldn't even be forced into an abnormal position. Twister acted as if there was never anything wrong with him. 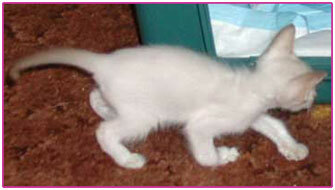 Twister is now in a GREAT pet home in in Ramona, CA. He shares his purrs with new mom and dad, Paula and Richard, and a feline buddy named Diesel... a very happy ending to the story of a very special kitten. Front Legs must be splinted. Hind legs correct on their own. 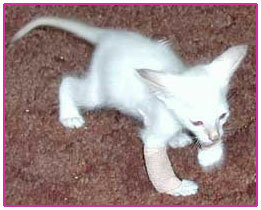 Begin splinting as soon as the kitten is walking. Splints must be strong enough to support but flexible enough not to cut off circulation. Twister was the result of a 100% outcross breeding. 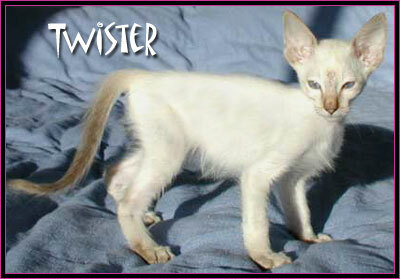 A full sister to Twister's father gave birth to a kitten born with the same tendon contractures as Twister had. This suggests there may be a genetic component to this condition or it may just be a coincidence.